Here's a high-priced, kitschy bag for the upcoming holiday season. It's an over indulgent handbag from Louis Vuitton. 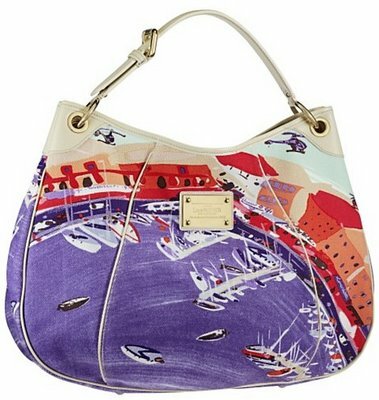 Priced just shy of $2000, the Galliera Riviera, named after the French Riviera (how snobbishly appropriate), is a canvas hobo-style bag that features a rather vibrant illustration of the famed French resort locale, an adjustable leather shoulder strap and an open top with magnetic closure. A plus for this special collection design is the large 20 x 13.5 x 8 size, yet its' generous dimensions cannot make up for what amounts to a very pricey, one-trick-pony of a bag. Still, if you collect LV and have the extra cash to spend, I suppose it'll make a rather cute, attention-grabbing day bag. Just restrict its' use to a cruise ship or the French Riviera itself.